With a few pennies here, a couple of quarters there, it’s amazing to see how our local Speedways and their customers are using spare change to change the lives of kids at Penn State Children’s Hospital. In our first year of partnership with Speedway, associates and their customers have raised nearly $50,000 for Children’s Miracle Network Hershey through coin collection canisters. 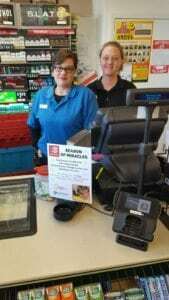 General Manager Jen (in black shirt) and associate Jalynn work at store #6732 from Area 486, Region 75 in Lebanon, PA. Jen’s daughter, Everleigh, spent a month in the Neonatal Intensive Care Unit at Penn State Children’s Hospital, so Jen is rallying her team and customers to give back to a program that helped her family. 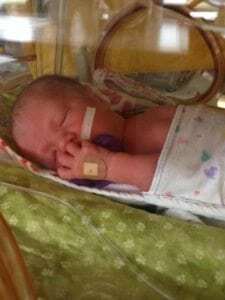 $50,000 could purchase a NICU incubator for our hospital, similar to the one Jen’s daughter used during her stay. Thank you to Speedway associates, customers and Area 486 Manager Dustin Doebler, who also serves on our Children’s Miracle Network Hershey Advisory Board. Support the #SeasonofMiracles by donating change at your local Speedway. Together, we can save kids’ lives.